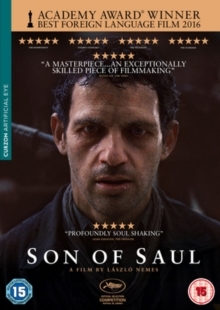 Set in 1944, the story follows Auschwitz prisoner Saul Ausländer (Géza Röhrig) who is forced to work with a Sonderkommando unit, burning the bodies of fellow Jews in the camp's crematorium. When Saul finds the body of a young boy he believes to be his son he risks everything to try and save him from being cremated and vows to give him a proper burial. The movie won the Golden Globe and the Academy Award for Best Foreign Language Film. Set in 1944, the story follows Auschwitz prisoner Saul Ausländer (Géza Röhrig) who is forced to work with a Sonderkommando unit, burning the bodies of fellow Jews in the camp's crematorium. When Saul finds the body of a young boy he believes to be his son he risks everything to try and save him from being cremated and vows to give him a proper burial. The movie won the Golden Globe and the Academy Award for Best Foreign Language Film.